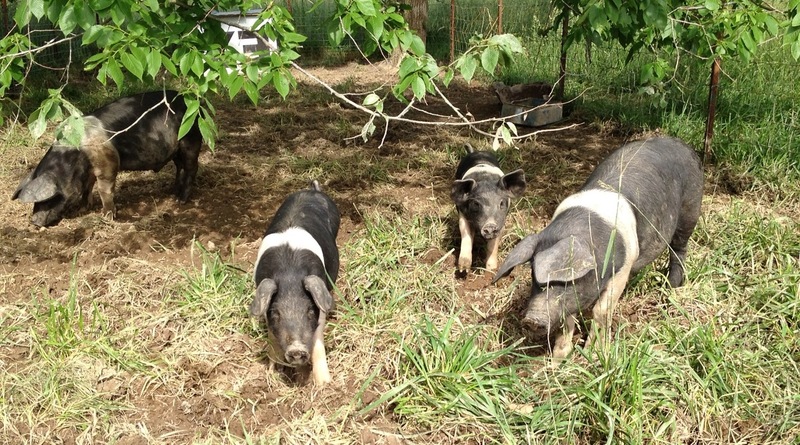 When we decided to start raising Dorkings, the search was on to find some breeding stock. 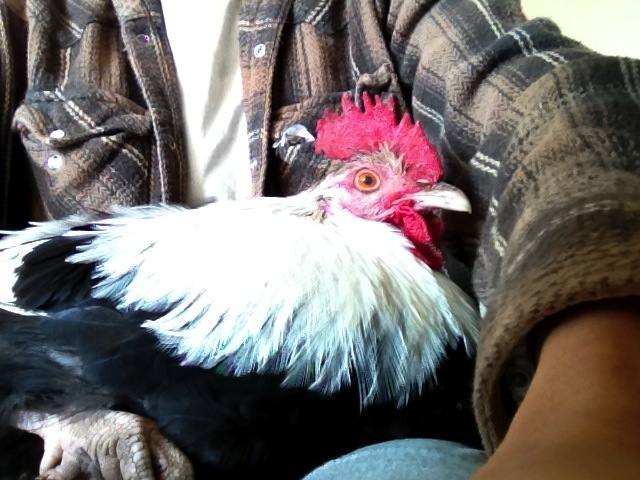 Chicks are hard to come by, so when I found a young rooster about 2 hours away in Columbia, we decided to get him. I sent my deposit, and she sent a pic. I immediately named him Hamlet. A month later, we drove up to get him. By the time we got home, I knew he wasn’t a Hamlet. He was sweet and would come when I called him. He would let me hold him and stroke his feathers. 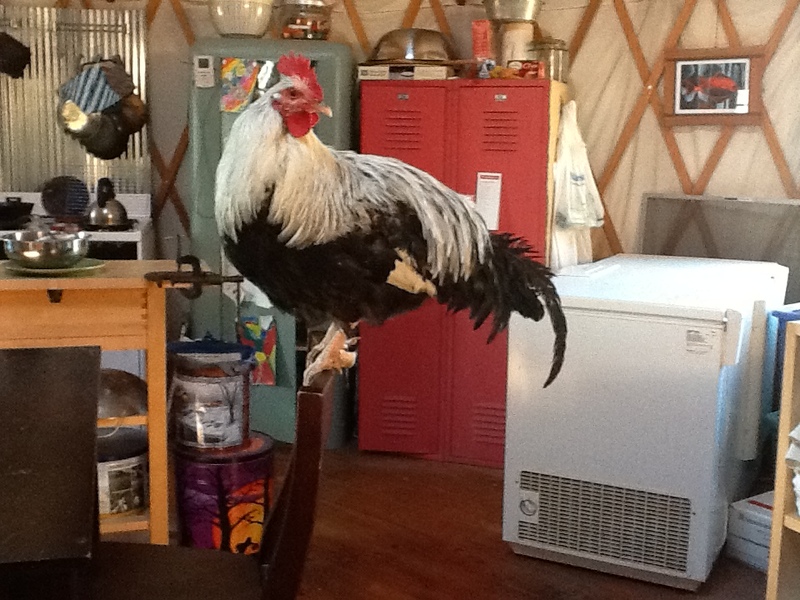 This was no mean “I’m going to spur you when you turn your back” kind of rooster. He was a lover. He was fancy. He WAS Ron Rico. The girls took a while to get used to him. The old ladies would torment him. I mean chase him around the yard and coop relentlessly. The younger girls just liked that they could nip at him and finally feel superior to someone. 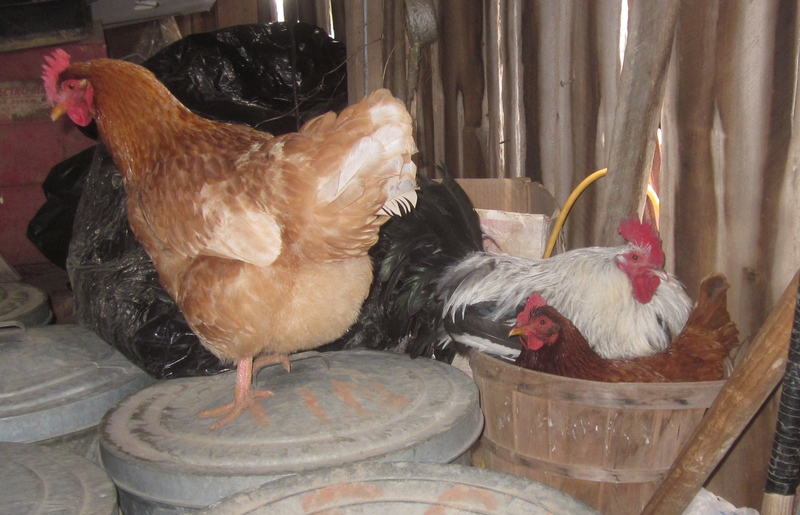 We had a batch of meat birds close to the barn, and Ron Rico took to them. He would walk back and forth and back and forth along the fence, showing off his beautiful feathers, trying to entice someone to come close. A few would, but poor Ron Rico, like most young boys, would turn into a spaz and they would run away (this was the bunch that Agnes was in). We saved about 8 from that bunch and Ron Rico and Agnes shared the flock nicely. Ron Rico getting cozy with one of the young girls in the nest bucket. Old Lady is disgusted by the whole thing. By the time Agnes was gone, Ron Rico had finally come in to his own, perfected his crow (oh it was such a SAD crow to start with! ), and started to look out for all the girls. Part of a roosters job, besides breeding, is to make sure his flock has food and warn of any dangers. So he would cluck and coo when he found something good to eat, or send out the alert when a hawk was overhead. Although the old ladies seemed to ignore him most of the time. When he started to take care of his breeding duties, I wasn’t quite sure if he was completing the task. You see, besides the characteristic of one extra toe, Dorkings also have short legs. Very short legs. 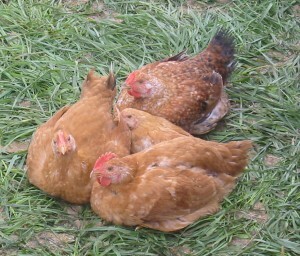 While most chickens look like they are high-stepping when they run, Dorkings go into low rider mode and hug the ground. It was very funny to watch him chase the girls. He never seemed to be in quite the right position. But apparently I underestimated his ability. We had 2 girls go broody and 4 out of 7 hatched the first time and 4 out of 9 hatched the second time, with 3 more that didn’t develop in enough time to hatch. So that is a pretty damn good fertilization rate. After surgery, Ron Rico gets to hang in the house. But poor Ron Rico had his problems. Mainly injuries. He had a cut on his extra toe that needed surgery twice, countless patching to his comb from the girls pecking him, and a trip to the vet for a huge gash on the back of his neck. I think he may have just cut his toe and I didn’t notice until it was swollen. I did surgery solo once, the next time I needed Fred’s help. The gash on the back of the neck was interesting. We were in the creamery finishing up butchering when Ron Rico jumped on the step and kept looking inside. I though it was odd, but went about my work. After a few minutes, he was still there, just walking back and forth. I asked Fred, “what is his problem?” With that, he turned his head so I could see the blood down his back. I freaked. I went out to find a cut from one side of his neck to the other that was perfectly straight and looked like someone used a razor. The blood had coagulated enough to stop blood loss, so we cleaned up, and got him to the vet. This is where having a sister-in-law as your vet helps. She met us at the clinic and cleaned and sutured him up. We were all amazed at how well he did. With nothing to numb him, he sat there perfectly still and let her fix him. 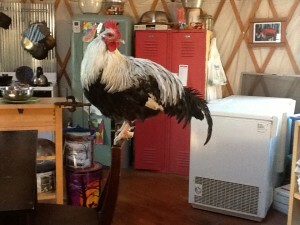 One flinch, but nothing like you would expect from a rooster having surgery. He was like this with all of the surgeries and bandaging. It was amazing. After a couple of weeks, the scab fell off and he was as good as new. I still have no idea how it happened. Since our goal was to breed Dorkings, and we had bought some chicks, I knew the day would come when we would need only one rooster. Orville was still too young to breed, and I thought maybe Ron Rico would be the better quality bird so he would be spared. But on the morning we were moving everyone to our new house, I found Ron Rico dead. We moved everyone to the empty brooder house overnight to make it easier to catch them. Maxie was on guard outside to keep them safe. The next morning, there he was, by himself in the corner, eyes closed, on his side. He wasn’t eaten or damaged at all. All of his feathers were perfectly in place. I have no idea why he died. Maybe a snake got in and squeezed him or he ate something he shouldn’t have. I don’t know. It’s hard to watch the girls out on the new pasture and not wish Ron Rico was with them. 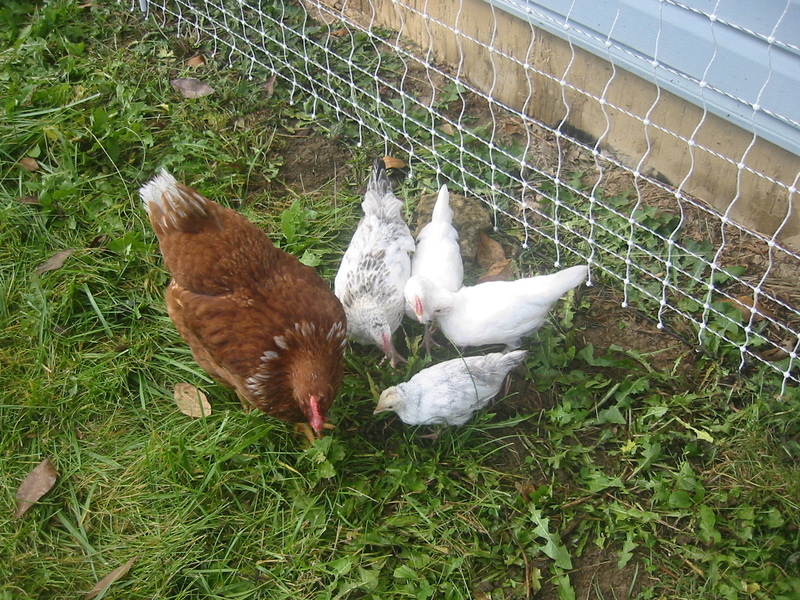 I am happy the girls hatched out some of his chicks. Gwen, Roger, Olive, Dave (he’s actually a she), and Charlie all have his extra toes and fancy feathers. As a bonus, I think Dave may be from Ron Rico and Pee-Wee; she’s super tiny. So some part of Ron Rico lives on. Old Lady with Roger, Charlie, Olive, and Dave. Notice how much smaller Dave is than the rest of them. We came upon this breed by chance. The farm we bought our American Milking Devons from raised them, and on a tour of the farm, we decided we would get a few when we came back to pick-up our cow/calf pair. 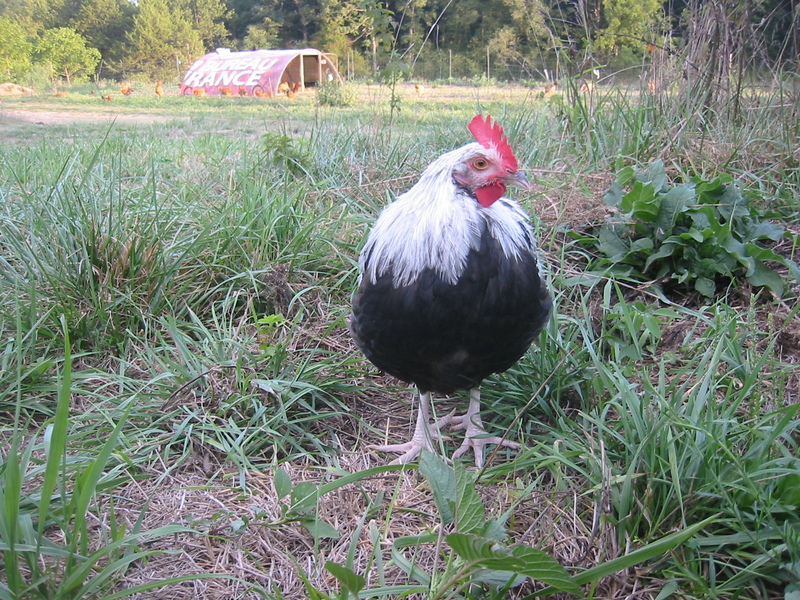 The Wessex Saddlebacks (WS) is not only an old heritage breed, but a rare one. Almost extinct in their native England, there is a huge effort in Australia and New Zealand to preserve the breed. There is one farm, Flint Hill Farm, here is Missouri that is one of the few breeders in America. The WS are a hardy breed of pig. 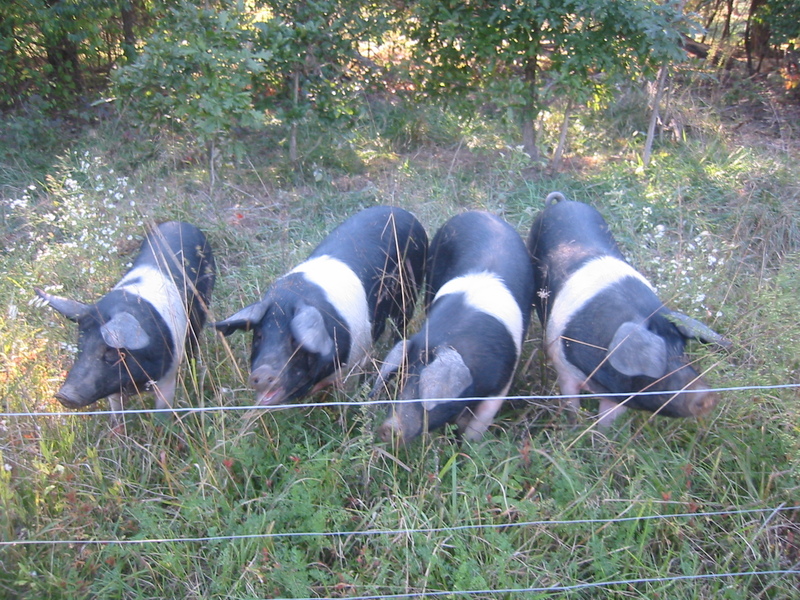 They do well foraging on pasture and were mainly bred for their excellent bacon and hams. 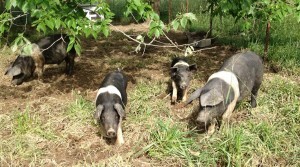 We decided to get 4 weanlings, 2 gilts (girls) and 2 boars (boys). 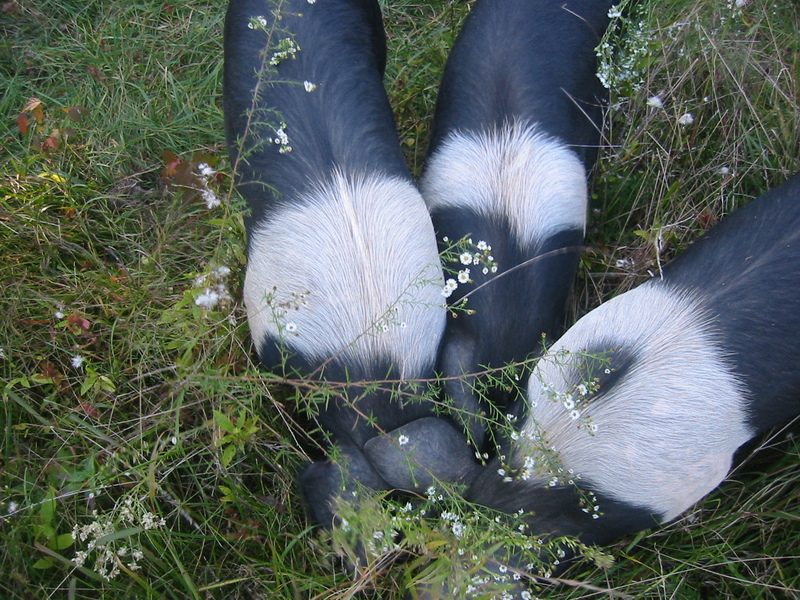 With the help of my vet sister-in-law Kathleen, we castrated the boars ourselves, turning them into barrows. I don’t think we will do that again. One, it is stressful for all involved. Two, I am not sure if it necessary to get rid of the boar taste or “taint” as it is called. The next pigs we get, we will leave them intact and see what happens. Supposedly, raising them on a more pasture based system, which we are working towards, lessens the risk of taint. People with mature breeding boars have butchered with no problems. Third, it is a a lot of stress for me to do post-op care. I was constantly checking to make sure they were healing well. The incisions are pretty well healed up after a week, but a week of fretting over it is too much for me. They found something good to eat! We set the pigs up in a good sized paddock attached to our potbellies pen with a small house for them. I have never raised pigs before. Fred has experience with it, but I sort of took over the pigs at the beginning. I fed and watered them. I scratched them, picked off ticks, monitored their poops, check eyes, ears, and tails to make sure all was well. A pig with a curly tail and clear eyes is a happy pig. A straight tail and runny eyes means something is wrong. They got used to the daily checkups easily. As they got older, I would check them once or twice a week. I talked to them and watched them. I trained them to come when I clapped my hands repeatedly. Dot is pretty obvious with the dot on her shoulder. Double Trouble, because he had the black and white double stripe on his shoulders. A-hole, because he is an a-hole to the others; always pushing and shoving. I never thought I would name anything Princess, but she was the first to let me scratch her, loved to be rubbed on and snuggle up to me. Five months after we brought them home, it was time to butcher. We wanted to do it ourselves. Well, I wanted to do it ourselves. Just like with the chickens, I don’t like passing that task off to a stranger. However, with the new house, chickens left to butcher, fencing to be put up, and family commitments, it just wasn’t going to happen. After talking to and visiting a couple of processors, we chose one to use. We moved the trailer into the paddock and started feeding them in there. By the time the day rolled around, they went into the trailer easily. At the processor, I rubbed on Big A as we waited to unload. I started to cry a bit. It’s never easy. But I think if we had done it on the farm, in some way it would have been a bit easier. I loved having the pigs. And next year we will get more. And next year we will butcher on the farm, that is for sure. 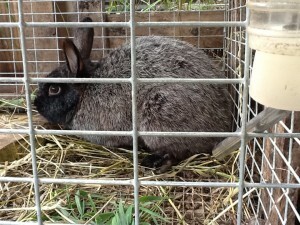 When we picked up our milk cows and pigs, the woman offered us a breeding pair of Silver Fox Rabbits. When I hesitated to answer, she offer the cages to go with them. How could I pass that up? 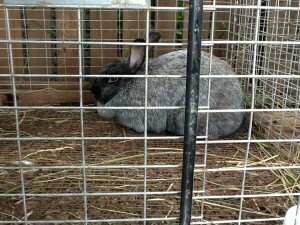 I have been talking about getting rabbits for meat and fur for about a year. I got some hides from our friend’s dad (although I have yet to tan them) and want to use the fur to make different thing. Gloves, bags, jackets, blankets. I ate rabbit in France and loved it. So this seemed like the perfect opportunity. When I saw them, I knew what to name them…Carmen and Ernesto. Since we were not planning on having rabbits, we weren’t set up for them. 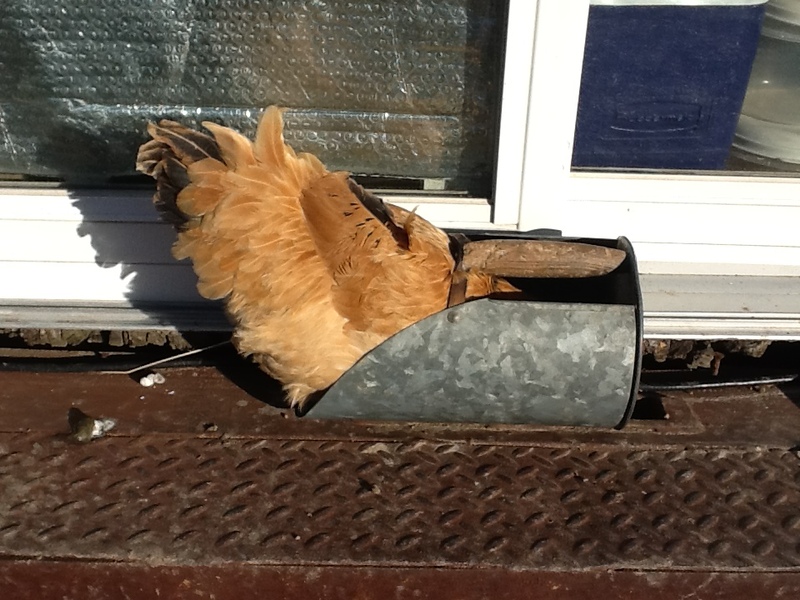 Luckily, the old goose house wasn’t being used and their cages fit perfectly. I was sent home with a pack of pellets, so food was taken care of. Their first morning, I picked a few handfuls of grass and clover for their breakfast and lunch. By the time dinner had rolled around, I had done a bit of research and found out not to give them clover because it gives them gas and they have no way to pass gas. UGH! Apparently, rabbits have a complex digestive system. Fiber is what they need most. So grasses and hay. Lots of stemy stuff helps keep their teeth naturally filed down. 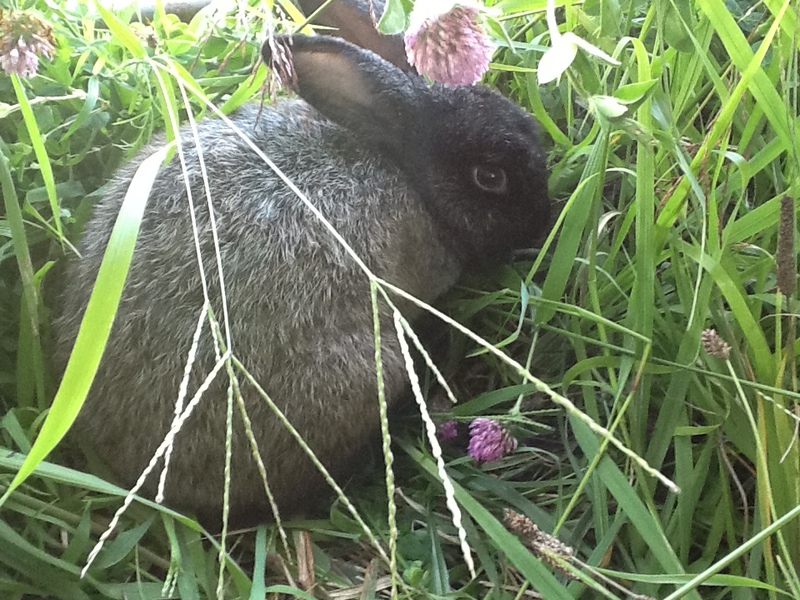 And the idea of a rabbit wreaking havoc on your garden isn’t quite true. While they will go in and eat around, they don’t usually eat a lot of fruits and veggies because it doesn’t have enough fiber and throws their digestive system into disarray. Don’t get me wrong, they will eat things they shouldn’t, just like us. 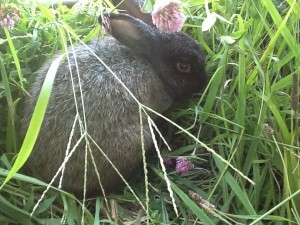 But rabbits in the wild are able to control what they eat and when, and can stave off most digestive issues. Not so true for domesticated rabbits. Once a rabbit’s gut shuts down, death usually follows quite soon. Another interesting part of a rabbit’s system is hind gut fermentation. Since a rabbit’s diet is so high in fiber, sometimes they don’t get all the nutrients out of the plants. Whatever needs a bit more processing gets diverted to the hind gut, or the cecum. There it is mixed with lots of good bacteria, yeast, and other organisms that help break it down further into cecotropes. Cecotropes is a special kind of poop that is nutrient rich, so the rabbit eats it as soon as it is expelled. Yes, kind of yuck, but also quite ingenious. 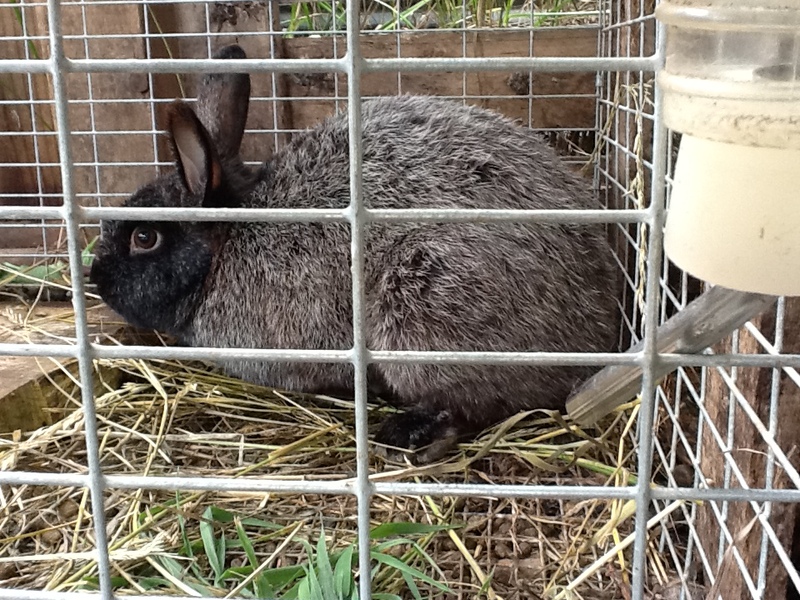 So if a rabbit does not get enough fiber to start with, they miss out on a lot of nutrients. Now, when I feed them it is a mix of grasses, plantains (the broadleaf weed, not the banana like fruit), mint, dandelions, and chicory. While Carmen was more interested in pellets than fresh food, she figured out what she was missing and now cleans up her food as well as Ernesto does. Having them on a fresh diet isn’t easy. There are plenty of days you’ll hear me scream, “ARGH! 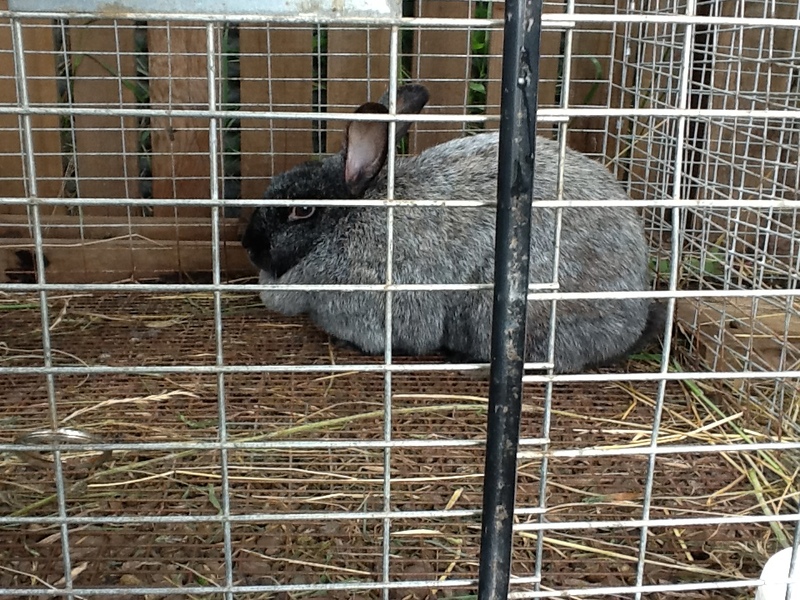 THE RABBITS!” and see me hurriedly picking over the yard. And now, Carmen turns her nose up to pellets. When the chickens are out of the tractors, the rabbits go in. I alternate free range days between them and they seem to love being out and about. The plan is to start breeding these two and have our own rabbit meat, with the added bonus of hides/fur. But for right now, they are just living the good life. When I was a little girl, my dad brought home a cage of quail chicks. I am not sure why he did, but I placed them on my toy shelf and cared for them. There was one that was small and got trampled by the others. I tried to make sure he got enough food and water so he could grow, but one day I checked in on them and he was dead. I was so sad and cried as I buried him in our yard. I felt like I had failed him, that I should have done more. Today I had those same feelings. Yesterday, I found Pee-Wee on the floor of the coop sleeping. I thought maybe she had been picked on by the girls so much, she was just trying to stay safe and rest. I picked her up and put her on top of the coop in the shade for a few hours. Later, I moved her into the feed shed. She still didn’t want to do anything but sleep. I gave her some feed, but she couldn’t seem to find the food, pecking at the table. Even the rattle of the can didn’t perk her up. I took her home last night and made some hot oatmeal and she ate a bit. This morning there was no change. I made her drink and eat, but she still wouldn’t stand on her own and now she wouldn’t open her eyes. I was torn between hoping she would snap out of it and ending her suffering. We had finished up butchering and I went to check in on her and she started flapping around. Before I could open the cage, she stood up tall, gasped, and fell over. I burst into tears as Fred tried to console me. I have no idea what was wrong. Had she eaten something she shouldn’t have? A disease? But I think Fred’s explanation may be right…her tiny body just wasn’t made to live so long. Pee-Wee was one of the meat birds we saved. They are bred to grow and be butchered, not live a long life. If the hens don’t make weight by the last butchering, we keep them as layers. Pee-Wee was well below butchering weight, like a third of the weight of the others. I am not sure if it was because of her stunted growth, but she also wasn’t quite right in the head. She had a thing about eating…she wanted to eat out the bucket or can, not the ground or feeder. Not sure if that is why she never really grew. I heard of chickens having twisted beaks and a hard time eating, so I checked her out. No twist. So when it was time to eat, I would let her eat out of the can. When she was with the layers, I couldn’t put the can by the ground without everyone else trying to eat, so Pee-Wee started to jump on my lap to eat. Then she started to climb up my leg as soon as she saw the can. Our routine was for the other girls to get fed, then I would slap my knee, she would fly up to my bent knee, and I would put my arm under her for her to roost on while she ate. If I couldn’t do this with her, she would just walk around the food confused as to what to do. She would peck a bit, but not like the others. Pee-Wee with her security team. She was a sweet chicken; always wanting to be with me. When they were out roaming the farm, she’d be in my business, under foot, trying to get some love. 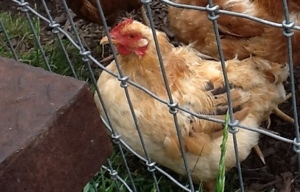 When they moved into the chicken oasis, she would squeeze under the gate to come sit with me. It’s like she didn’t know she was a chicken. And when she got mad at me, she would let me know. Many a time did she walk right up to me, hop on my lap, peck me hard, jump off, and walk away. 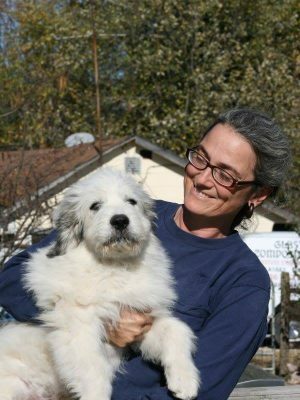 I would make it up to her with a little extra wheat at the end of the day and she would sit on my lap and snuggle. Her fellow meat birds didn’t pick on her, quite the opposite. 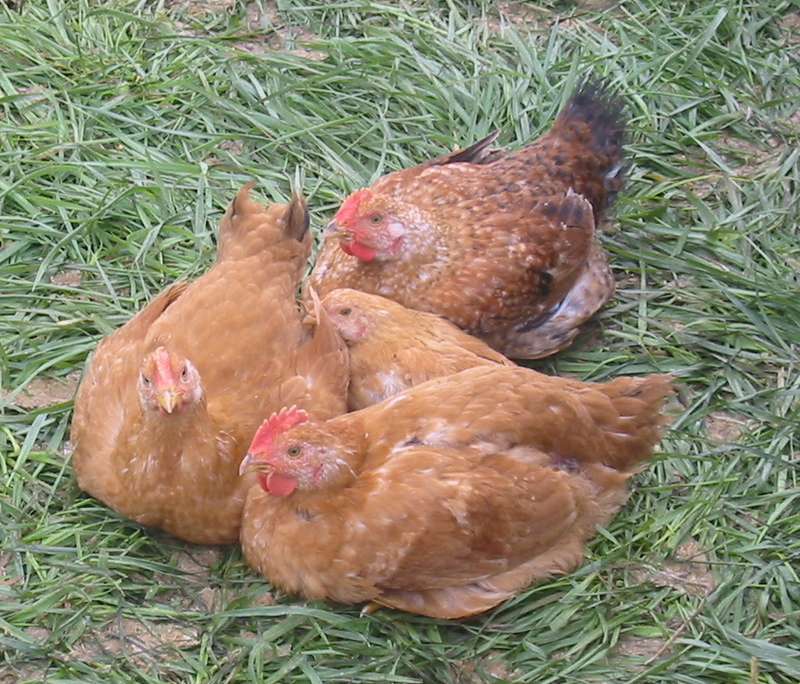 The above picture was typical of how she would spend her days…surrounded by 3 birds. Never once did I see them pick on her, it was like they knew she was different. 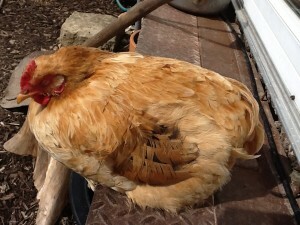 The hard thing with chickens is that when they are sick, by the time they show signs, it’s usually too late. I know she had a good life, but the feeling that I failed her is still there. I guess it’s a good thing it hurts my heart so much. It confirms that I haven’t lost compassion for my animals. I think if the day comes that I am not saddened by the death of my animals (either accident or planned), that will be the day I will no longer keep them. For all the special treats and treatment Pee-Wee had in her life, and there were A LOT, she gave me a great year of companionship. Thank you, my sweet Pee-Wee.